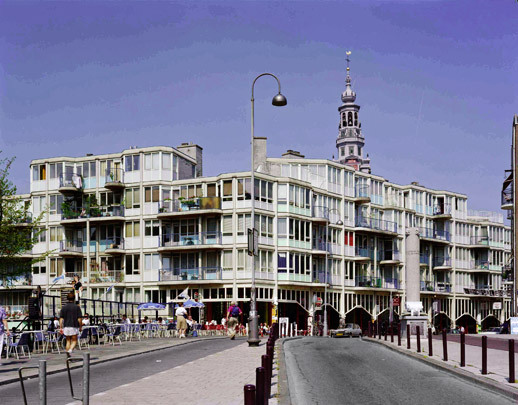 The deterioration of the Nieuwmarkt reached its peak around 1970 with preparations for a large-scale swathe of demolition for construction of the Metro and industrial transport routes. Taking the slogan 'building for the neighbourhood', locals, activists and architects fought together to revivify the area: this was to include restoration of historic buildings, developments made to fit in with existing street patterns and scale, priority for combining housing with small businesses and shops, and new buildings which locals could afford. The intervention of Van Eyck and Bosch goes back to a 1970 urban plan for this area in which, for the first time, traditional urban values were to co-exist with sixties expansionism. The redevelopment scheme did not shun expensive and complicated structures straddling the Metro. The first buildings realized were two projects by Bosch. This infill housing illustrates typical seven-ties ideas on development adapted to its surroundings, with a suggestion of the small-scale in the cappings and of attunement in the traditional brick structure. Bosch's major contribution is the Pentagon, a five-sided perimeter block adhering to the existing building lines and ranging 88 dwelling units round a semi-public internal court. Hans Hagenbeek's apartment building on Zuiderkerkhof is quite a feat of technique, founded as it is on Metro tunnel sections and cleverly concealing air ducts for the metro behind a waterfall. The block by Hans Borkent has a daring colour scheme to a design by the artist K. Makkink. A later project by Paul de Ley, the corner development on Zwanenburgwal, illustrates recent trends in urban regeneration: a revamping of functionalist architecture of the thirties with rendered walls, ribbon windows and rounded corners.